The Langer Award was established in honor of Dr. Marion Langer, executive director of the American Orthopsychiatric Association from 1953 until her retirement in 1988. Dr. Langer had a PhD in sociology. She was an expert on widowhood. In addition to her work with Ortho, Dr. Langer served on the boards of the Bazelon Center for Mental Health Law and the National Coalition Against Censorship. The Langer Award recognizes distinction in social advocacy and the pursuit of human rights. Dr. Emily Vargas-Baron directs and conducts activities for The RISE Institute, a nonprofit organization committed to supporting activities for education and early childhood development in countries affected by conflict or extreme poverty. She also consults internationally in the fields of education and integrated early childhood development, focusing on policy planning, training, program design, and evaluation research. From 1994 to 2001, she was Deputy Assistant Administrator of the U.S. Agency for International Development, where she directed the Center for Human Capacity Development. Previously, she founded and directed a research and development institute for early childhood development in Austin, Texas, called the Center for Development, Education, and Nutrition (now called Any Baby Can). Dr. Vargas-Barón was an Education Advisor for the Bogotá Office of The Ford Foundation and a Program Specialist in Education for UNESCO in Paris. She holds a Ph.D. in Anthropology with a focus on Education from Stanford University, where she was also an Associate of the Stanford International Development Education Center. She is the author of many books, chapters, articles, and research and evaluation studies, and she has worked in Latin America, the Caribbean, Sub-Saharan Africa, North Africa, the Middle East, Europe, Eastern Europe, the Caucasus, Central Asia, and South Asia. Michael Wald received the Marion Langer Award for distinguished contributions as a scholar and public servant to enhancement of rights and well-being of children and families. In particular, he was recognized for his advocacy and thoughtful contributions on parenting especially as it relates to developing an effective system for helping children in neglectful families. Professor Wald is the Jackson Eli Reynolds Professor of law, Emeritus, at Stanford University. He previously served as the deputy general counsel to the U.S. Department of Health and Human Services during the Clinton Administration, the executive director of the San Francisco Department of Human Services and a senior advisor to the President of the William and Flora Hewitt Foundation. Tom Tyler was selected for the 2015 Marion Langer Award for his contribution to our understanding of the requisites for civic engagement and community life. His research explores the role of justice in shaping people's relationships with organizations and communities. In particular, he examines the role of judgments about the justice or injustice of group procedures in shaping legitimacy, compliance, and cooperation. Professor Tyler is the Macklin Fleming Professor of Law and Professor of Psychology at Yale Law School. In 2012, he was honored by the International Society for Justice research with its Lifetime Achievement Award for innovative research on social justice. Gregory Herek received the Langer Award for his contribution to our understanding of prejudice, particularly as it relates to LGBT people, and for his policy efforts to promote the rights of LGBT people and people with AIDS. He has been a pioneer in the scientific study of prejudice against LGBT people and the effects of such prejudice on its targets. Dr. Herek is a Professor of Psychology at the University of California at Davis. He is the past chair of the American Psychological Association's (APA) Committee on Lesbian and Gay Concerns, and he has served on the APA Task Force on avoiding heterosexist bias in research on AIDS. In 2006, Dr. Herek received the Kurt Lewis Memorial Award for "outstanding contributions to the development and integration of psychological research and social action." Sara Lawrence-Lightfoot was honored for her clarification in scholarship and by example of the significance of respect as a value, a strategy, and a way of life in the promotion of human rights. Reminding readers that respect is grounded in reciprocity, not authority, she exemplifies that approach in her own careful approach to research interviews. No matter what the age and status of participants in her studies may be, Dr. Lawrence-Lightfoot appreciates the dignity of the people who tell their stories to her. Whether the participants are children, parents, teachers, or grandparents, she listens emphathetically and quietly illuminates institutional obstacles to social justice in schools, workplaces, and other settings of everyday life. She celebrates the lives of all who confront and overcome such discrimination and oppression and, by so doing, pave the way for others to enjoy a culture of caring. Judith Torney-Purta was honored for her leadership in the generation and diffusion of knowledge about the prevalence and antecedents of democratic concepts, values, and attitudes among early adolescents in numerous societies around the world. In landmark cross-national studies at times of enormous global change, Dr. Torney-Purta has been preeminent in her contributions to cross-cultural understanding of the factors involved in young people's readiness to promote human rights and social justice. She also has led coincident global assessments of civic education. In so doing, Dr. Torney-Purta and her colleagues have documented the common shortcomings of young people's preparation for meaningful exercise of citizenship and for their tolerance of such self-expression by others. Taken together, these studies provide important lessons for education of children and adolescents in both advanced and emerging democracies -- lessons that Dr. Torney-Purta herself has applied in curriculum development for international audiences. Dr. Torney-Purta is a Professor of Human Development at the University of Maryland. Robert Franklin was honored for his promotion of prophetic engagement of primary community institutions, especially religious congregations, in thought, conversation, and action in pursuit of social justice in the United States and abroad. A leading public intellectual, Dr. Franklin has been an influential foundation program officer, university professor, seminary president, college president, and social commentator. In all of these contexts, he has persuasively advocated and, more importantly, thoughtfully demonstrated both courage and civility and both rationality and spirituality in honest discourse on some of the most sensitive issues affecting American families in general and African American families in particular. A leading scholar on the papers and speeches of Martin Luther King, Jr., Dr. Franklin, like Dr. King, is guided by a vision of a "socially conscious democracy" strong enough to tolerate and indeed learn from expressions of uncomfortable truths. Dr. Franklin recognizes the transformative power of respectful relationships -- reconciliation, tolerance, and love -- in the creation of a just social order. Accordingly, he has insightfully identified the points of common experience and belief among all people who hope for community, whatever their politics and theology may be. 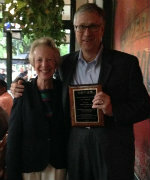 Anne Smith was honored for her research and advocacy to ensure that the voices of children are heard. Working both in New Zealand and in international contexts, Dr. Smith worked to increase knowledge about children's experience in both exceptional and everyday contexts. As a center director and an international scholar, she worked both to transform studies of childhood and to diffuse the resulting knowledge within the academy itself and in teachers' lounges, television studios, and the halls of government. Showing due respect for the dignity of both children themselves and the adults who care for them, Dr. Smith devoted much of her career to making schools and child care centers more humane. Exploring children's own values, attitudes, and experience, she made groundbreaking contributions to understanding the nature and implications of such a child-centered perspective. Her scholarship extended beyond educational and child care settings to the home, the playground, the health clinic, the social service agency, the lawyer's office, the courtroom, and the policy arena. 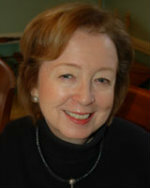 Dr. Smith founded the Children's Issue Centre at the University of Otago in Dunedin, New Zealand. M. Brinton Lykes was honored for her influential scholarship on the relation between mental health and human rights, for her analyses of the psychology of state-sponsored terror and other violations of human rights, for her contributions to peaceful transitions toward democracy in Guatemala and South Africa, and for her efforts to promote community participation. Dr. Lykes is Professor of Community-Cultural Psychology at the Lynch School of Education at Boston College. She founded the Ignacio Martín-Baró Fund for Mental Health and Human Rights. 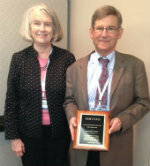 Felton Earls was honored for his pioneering work in the generation and application of knowledge about the critical significance of collective efficacy in the safety, health, and dignity of children, families, and communities and for his leadership in galvanizing health professionals' attention to the obstacles for fulfillment of the right to health of children in need around the world. One of the most eminent behavior epidemiologists of childhood, Dr. Earls directed the Harvard Project on Human Development in Chicago Neighborhoods, perhaps the largest social science project ever conducted. He has applied his findings about the importance of community participation in projects in Brazil, Romania, South Africa, and Tanzania as well as the United States. He has concluded action research to examine the key ingredients in young people's engagement in deliberative democracy, and he has extended this work in relation to the effects on children of the HIV/AIDS pandemic in southern Africa. Michael Wessells was honored for his tireless efforts to preserve family and community relationships for children in zones of armed conflict or natural disaster. Working for the Christian Children's Fund and consulting to numerous other international organizations, Dr. Wessells has helped to mobilize psychosocial relief for children in many countries torn asunder by armed conflict or natural disaster. Assisting local helpers in facilitating the recovery of children in exceptionally difficult circumstances, Dr. Wessells has given particular attention to the vexing problem of reintegration of child soldiers. As a result of Dr. Wessells' work, many children who have faced tragedies of sometimes barely imaginable scale are recovering, and the world is a safer and more humane place.